« Hurray It Is Fall! 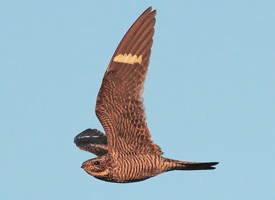 Last year I tried a birding activity I had never heard of before – a hawk watch for migrating Common Nighthawks. Bedford Audubon Society sponsored this event at the Chestnut Ridge Hawk Watch Platform from 6:00PM until dusk. Nighthawks are not true hawks or even raptors. They eat flying insects, not small mammals. As their name implies much of their hunting takes place at night (actually twilight). You might think of them as the night time counterpart to swallows, zipping and zagging in the evening sky chasing flying insects. I often see them during night baseball games where they are chasing insects attracted by the bright field lights. The Nighthawk watch took place on a pleasant late-summer evening. After I climbed the hill to the bleachers I joined about a half-dozen other birders plus two full-time hawk counters. I love the setting of the hawk watch platform high on a bluff with unrestricted views. You can even see Long Island, 23 miles away. And I like to say, you don’t see a single man-made structure for as far as you can see. We scanned the skies from 6:00 until just before dark around 8:00. In that time we saw zero Nighthawks. In fact, we did not see any birds at all, maybe one Grackle. Yet it was a lovely evening and I found it tremendously enjoyable. I just received a notice that we will try it again this year. The 2nd Annual Nighthawk Watch will be Tuesday evening, September 27th from 6:00 until dusk at the Chestnut Ridge Hawk Watch Platform in Bedford Hills. I definitely plan to be there. Join me if you can. (Call or email for directions). I’m hoping we will see more birds than last year. But I can testify that it is a great experience even with no birds.